Love to catch the squirrels - this one was quite happy to have his picture made. FAV... great closeup! Super clarity! Super cute. I imagine all of the wildlife looking forward to your visits! That's really an in-your-face capture! yep, that's a grin. lovely detailed shot with great colour on his chest and tail. fav. Now that is a cute squirrel shot! Amazing! Love the wee curled feet! Wow!!! 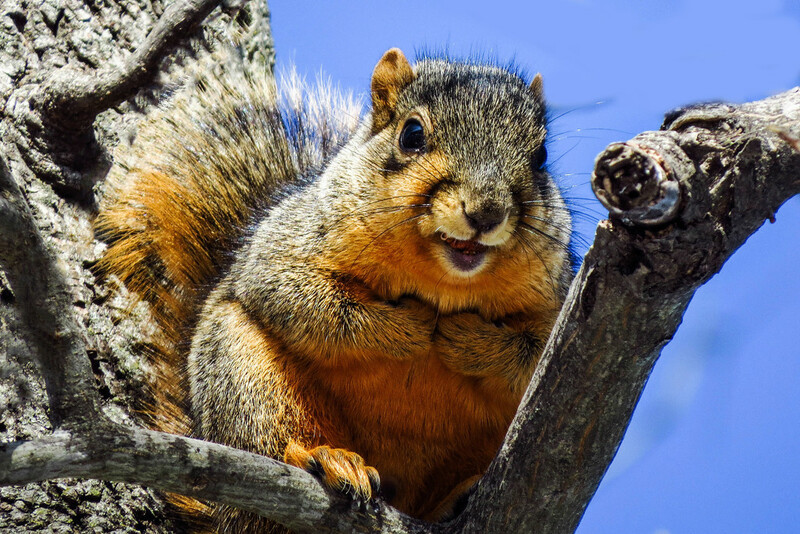 Fantastic close up shot of this adorable little squirrel caught grinning at you!!! FAV!!! Love the contrast of his rusty color against that blue sky! Love Love Love it!!! Instant Fav!!! =) Too CUTE!!! Love the little paws tucked in! Too cute! Love the contrast between the squirrel colours and the blue sky. Haha - squirrels are too funny! OMG, how cute is he? A great big smile and his little paws up to his chest like he's giving you a hug!!! You should frame this one!! How very cute and the details and lighting are perfect and what a POV!!! FAV!!!!!!!!!!!!!!! Oh, he loves you! What are you feeding him?! He looks so sweet and stands out so well against the blue sky! So lovely, nice pov. and textures. fav. Lovely against the blue background! He is very cute. Looks like he is really grinning at you. Terrific capture. LOL!!! What a cheeky happy squirrel and love the pose between the branches. FAV! Beautiful capture! love his pose! Cute he looks like he is smiling for the camera! Stunting close up and details. Beautiful captured. Ahhh! It's almost as if he's thinking, "Me? You wanna take a picture of ME?" Precious little bugger. Super picture of him.